1 of 3 Heat oil in a large pot over medium heat. Add onion and pepper and cook 5 minutes, stirring, until softened. 2 of 3 Increase heat to medium-high and add turkey, breaking apart with a wooden spoon. Cook 5 minutes. Sprinkle with chili powder and salt; cook 1 minute. 3 of 3 Stir in ketchup, vinegar, molasses and sugar. Add drained tomatoes, reduce heat to medium-low and simmer 15 minutes, stirring occasionally. Add beans and jalapeno and heat through, about 2 minutes. Meanwhile, microwave rice as per package directions, about 90 seconds. 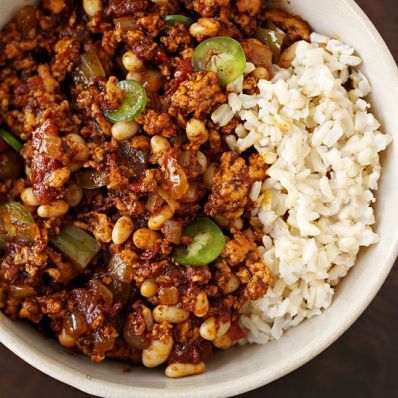 Serve chili over rice.